Most studies based on trade statistics date the emergence of the First Globalisation around 1870. These studies, however, generally rely on data that begins in 1870. To better understand the chronology of globalisation, we put together the most comprehensive bilateral trade dataset to date. It tells us that the First Globalisation began in Europe in the 1840s, before expanding to other continents later in the 19th century. Technological innovations (oceangoing steamships, transcontinental telegraph) and pro-trade policies (bilateral free trade treaties, the gold standard) of the second half of the 19th century are considered the sparks for globalisation. This can't be the case if globalisation began before they were created. To create the TRADHIST dataset, we collected more than 1.9 million bilateral trade flows from 1827 to 2014 (Fouquin and Hugot 2016b), using a common framework to make it possible to compare both periods of globalisation. Data for the 1827-1870 period have not been collected before now. To do this, we aggregated six pre-existing sources as well as data directly extracted from customs archives, particularly before 1870. We also provided series of aggregate exports and imports, GDP, exchange rates, and bilateral distance. What do openness rates tell us? Figure 1 shows the evolution of export openness ratios (total exports/GDP) for three samples. Export openness doubles between 1827 and 1870 before stagnating until WWI. During the interwar period, openness falls below its level in the early 19th century, before rising again after 1960. 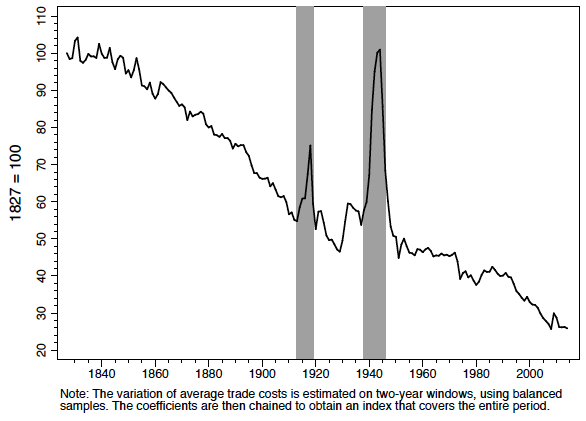 It is only in the late 1970s that openness returns to the levels already reached a century before. Trade openness, however, is a crude measure of globalisation. Average openness in 2014 is 22% for our sample of 110 countries. But is that figure high or low, compared to what it would be in the absence of any international trade barrier? Openness ratios are also sensitive to the global distribution of economic activity. If one country concentrated almost all economic activity, then aggregate openness would be very low because most goods would be produced and consumed in the same country. On the other hand, in a world of scattered economic activity, countries are naturally more interdependent. Trade openness is much higher. The difference between the two situations shows the degree of concentration of the world economy. It has nothing to do with the importance of trade barriers. What we call ‘globalisation’ is the convergence between observed world trade and a theoretical situation in which international trade barriers would be equally as constraining as domestic ones. This means we need a theoretical prediction of what international trade would have been in the absence of obstacles specific to it. Comparing observed trade to the prediction that emerges from the structural gravity model created by Head and Mayer (2014) evaluates the importance of the obstacles that are specific to international trade. The difference between observed trade and a counterfactual in which there would be no international trade barriers then reveals the aggregate cost that is specifically associated with international trade. These costs come from transportation and protectionist policies, but also factors like communication and exchange rate volatility (Jacks et al. 2008). Figure 2 shows the evolution of aggregate international relative trade costs for the entire sample. It shows that trade barriers have fallen by more than 70% since 1840, relative to intranational trade barriers. Of this, 50% occurred in the period before the Great Depression, and 20% since 1960. The First Globalisation had therefore already begun in the 1840s, before steamships, the telegraph or the gold standard, and before the wave of bilateral trade treaties signed by Western European countries in the 1860s. This was, however, a period of political stability in Europe after the Congress of Vienna in 1815. In the mid-19th century there were also unilateral reductions of trade protection, for example the repeal of the British Corn Laws in 1846. We found similar examples in other European countries. In the 1870s the Russian and American ‘grain invasion’ prompted higher tariffs in most of continental Europe. Trade costs, however, kept falling during this protectionist backlash, which suggests that it was compensated by the decline of other trade barriers. After 1918, totalitarian regimes emerged in the USSR, Italy and Germany, and the protectionist measures that were adopted after the Great Depression condemned any possibility of returning to the liberal golden age. High protectionism lasted until after WWII and the adoption of the GATT in 1947, which created multilateral liberalisation among developed economies. The Treaty of Rome (1957) began European integration, and internal customs barriers were abolished altogether in 1968. Finally, the generalisation of containerisation in the 1970s reduced transport costs. Our research shows that globalisations are also regionalisations. 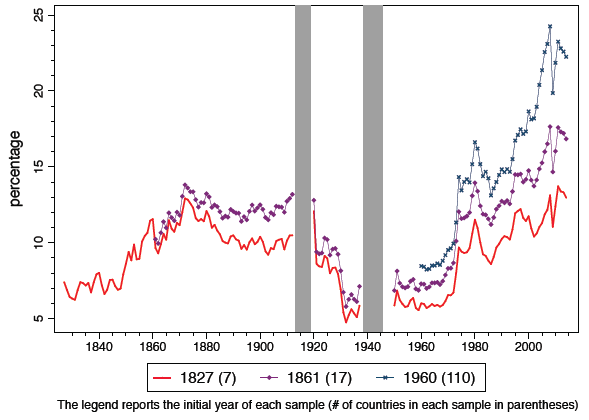 Estimating the trade cost index of Figure 2 for various subsamples, we found that the decline of intra-European trade barriers after 1840 preceded the reduction of transatlantic trade barriers that happened around 1890. In Europe, the fall of trade costs in the northwest preceded the fall in the south. We also isolated the effect of distance across partners on bilateral trade and show that both globalisations were associated with an increase in distance elasticity (Figure 3). In 1830, a 10% difference in the distance between two countries would have reduced bilateral trade on average by 3%. 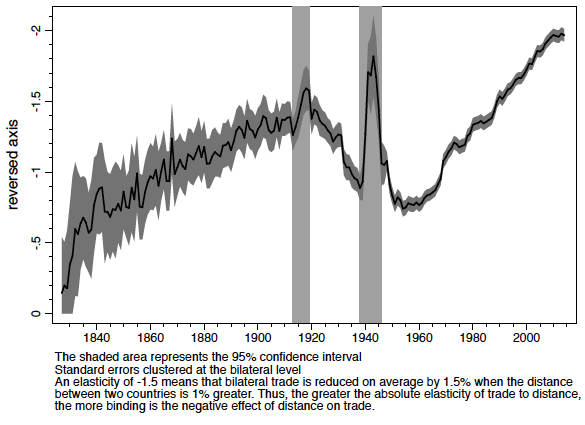 On the eve of WWI, it would have reduced trade by 13%; and in 2010, the reduction would have been 19%. Combes et al. (2008) and Disdier and Head (2008) found this result for the second half of the 20th century, but it applied in the 19th century too. During both periods of globalisation, nations focused on long-distance trade. The First Globalisation was built on colonial trade, and the Second was inspired by European-American and Asian-American trade. So the major role of regionalisation in both globalisations is surprising. Several hypotheses may explain this phenomenon. First, pro-trade policies have been primarily adopted between neighbouring partners. The post-war integration of Europe is the most obvious example. Second, regionalisation may also be due to the increased complexity of the goods that are traded. Language and cultural barriers, which are highly correlated to distance, may have become more important. Also, the fixed costs associated with trade (for example information gathering on local preferences, loading and unloading) may also have decreased relative to the actual cost of carrying goods from one country to another, which is strongly linked with distance. The rise of international trade during the 19th century was supported by European liberal trade policies and, later, by technological improvements in transportation and communication. The Great Depression and the two world wars challenged this trend, while trade was partly reallocated to more distant partners due to geostrategic reasons and European colonialism. Both globalisation and regionalisation resumed in the 1960s. But regionalisation has recently been fading, as the WTO has grown to include almost all countries in the world. The conversion of emerging and former socialist countries to free trade in the 2000s has stimulated long-distance trade. The dynamism of trade between Asia and the rest of the world is expected to persist, especially with the emergence of new actors such as India and Bangladesh. On the other hand, continued sluggish growth in Europe could limit the growth of intra-European trade. If so, the margin of growth for trade seems to be particularly large for long-distance trade, which gives a central role to TTIP and the TPP. Alternatively, perhaps globalisation has already peaked? The reorientation of Chinese growth to the domestic market should reduce its dependence on international trade. Growing inequalities in western countries generate opposition to globalisation. Renewable energies may reduce trade in hydrocarbons. Finally, the development of foreign direct investment substitutes local production for international trade. Combes, P-P., T. Mayer and J-F. Thisse (2008), Economic Geography: The Integration of Regions and Nations, Princeton University Press. Disdier, A-C. and K. Head (2008), “The Puzzling Persistence of the Distance Effect on Bilateral Trade”, Review of Economics and Statistics, 90(1): 37–48. Fouquin, M. and J. Hugot (2016a), “Back to the Future: International Trade Costs and the Two Globalisations”, CEPII Working Paper N°2016-13. Fouquin, M. and J. Hugot (2016b), “Two Centuries of Bilateral Trade and Gravity Data: 1827-2014”, CEPII Working Paper N°2016-14. Head, K. and T. Mayer (2014), “Gravity equations: Workhorse, toolkit, and cookbook.” In: Gita Gopinath, Elhanan Helpman, and Kenneth Rogoff (eds), Handbook of International Economics, Vol. 4. Amsterdam: Elsevier North-Holland. Jacks, D., C. Meissner and D. Novy (2008), “Trade Costs, 1870-2000”, American Economic Review: Papers and Proceedings, 98(2): 529–534.